cardcard1 /kɑːd $ kɑːrd/ ●●● S1 W2 noun 1 informationD [countable] a small piece of plastic or paper containing information about a person or showing, for example, that they belong to a particular organization, club etc Employees must show their identity cards at the gate. I haven’t got my membership card yet.2 BANKmoneyBFB [countable] a small piece of plastic, especially one that you get from a bank or shop, which you use to pay for goods or to get money Lost or stolen cards must be reported immediately. a £10 phone card Every time you use your store card, you get air miles. → charge card, cheque card, credit card, debit card3 BIRTHDAY/CHRISTMAS ETCgreetingsD [countable]CELEBRATE a piece of folded thick stiff paper with a picture on the front, that you send to people on special occasionsbirthday/Christmas/greetings etc card a Mother’s Day card4 HOLIDAYholidayDL [countable] a card with a photograph or picture on one side, that you send to someone when you are on holiday SYN postcard I sent you a card from Madrid.5 STIFF PAPERstiff paper [uncountable] British EnglishD thick stiff paper → cardboard Cut a piece of white card 12 × 10 cm.6 for writing information [countable] a small piece of thick stiff paper that information can be written or printed on a set of recipe cards a score card 7 games [countable] a) a small piece of thick stiff paper with numbers and signs or pictures on one side. 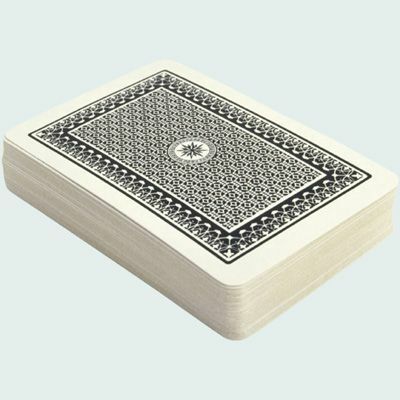 There are 52 cards in a set. SYN playing cardpack/deck of cards (=a complete set of cards) b) a game in which these cards are used I’m no good at cards. We were having a game of cards. Let’s play cards. a book of card games c) a small piece of thick stiff paper with numbers or pictures on them, used to play a particular game a set of cards for playing Snap8 → football/baseball etc card9 BUSINESSbusiness [countable]BBD a small piece of thick stiff paper that shows your name, job, and the company you work for SYN business card, → visiting card My name’s Adam Carver. Here’s my card.10 computer [countable]TD a piece of equipment inside a computer that the chips are attached to, that allows the computer to do specific things a graphics card11 → be on the cards12 → play your cards right13 → put/lay your cards on the table14 → play/keep your cards close to your chest15 → get/be given your cards16 → have another card up your sleeve17 → trump/best/strongest card18 → somebody’s card is marked19 AMUSING/UNUSUAL PERSONLIKE somebody OR somethingperson [countable] old-fashioned informal an amusing or unusual person Fred’s a real card, isn’t he!20 FOOTBALLsport [countable]DSH a small piece of stiff red or yellow paper, shown to a player who has done something wrong in a game such as football 21 list at sports event [countable] a list of races or matches at a sports event, especially a horse race a full card of 120 riders for the Veterans race22 tarot [countable] a small piece of thick stiff paper with a special picture on one side, that is put down in a pattern in order to tell someone what will happen in their future23 TOOLtool [countable]TIM technical a tool that is similar to a comb and is used for combing, cleaning, and preparing wool or cotton for spinning (spin) → hold all the cards at hold1(30), → play the race/nationalist/environmentalist etc card at play1(14), → stack the cards at stack2(4)COLLOCATIONS – Meaning 1: a small piece of plastic or paper containing information about a person or showing, for example, that they belong to a particular organization, club etctypes of card an identity/ID card (=one that proves who you are)All US citizens must carry an identity card.a membership cardDo you have a library membership card?a student cardEntrance is free if you have a student card.a medical card (=one that proves who you are when you change doctors)You will need to bring your medical card.an appointment card (=one with your appointments on)The dentist gave me a new appointment card.a swipe card (=one that you slide through a machine in order to open a door)Swipe cards are used to enhance security.a smart card (=one with an electronic part that records information)Keeping medical records on small plastic smart cards seems to be a success.a sim card (=one in a mobile phone that allows you to use a network)You may need a new sim card when you travel abroad.a donor card (=one that shows you want your organs to be given to someone when you die)We want to encourage more people to carry a donor card.verbscarry a card (=have one with you)Motorists could soon be forced to carry an ID card.flash a card (=show one very quickly)He flashed his ID card at the guard and walked straight in. COLLOCATIONS – Meaning 2: a small piece of plastic, especially one that you get from a bank or shop, which you use to pay for goods or to get moneytypes of carda credit card (=one you use to buy things and pay later)He had paid by credit card.a debit card (also check card American English) (=one you use to pay for things directly from your account)The store only accepts debit cards.a cash card (also an ATM card especially American English) (=one you use to get cash from a machine)You should report stolen cash cards immediately.a bank/cheque card British English (=one that you must show when you write a cheque)Always keep your cheque book and cheque card separately.a charge/store card (=one that allows you to buy things from a particular shop and pay for them later)Store cards often have high rates of interest.a phone card (=one that you can use in some public telephones)You can use this phone card in several countries.card + NOUNa card numberWhat's your card number?the card holder (=the person that a card belongs to)1 in 10 store card holders owes more than £500.card fraud (=the illegal use of other people’s cards)Many consumers are afraid of credit card fraud.card details (=the information that is on a card)Hackers stole hundreds of people's card details.verbspay by cardIs it all right if I pay by card?put something on your card (=pay by credit card)I’ll put the restaurant bill on my card.use your cardI don’t use a card if I can pay by cash.accept/take a card (=allow you to pay by card)Big hotels will accept most cards. card• I got a card from Henry; he's in Colorado.• I need to send a card to Mom for Mother's Day.• Harold was always such a card!• a card file• a birthday card• With its vast red ribbon and handmade card, it had transformed the garage into something quite magical.• Mr. Kim gave me his card and told me to call him.• a recipe card• I don't like if I can't see what's on the cards.• Notify the bank that you are canceling their card.• These cards are used rather like credit cards.• Just for the sake of clarity, perhaps we should call employees who do more than punch their time card intrapreneurs.• I enclose samples of the last two cards we have produced.membership card• It contained a registration card for the Republican party and a membership card to the National Rifle Association.• Smarter people were using auto club or age-group membership cards to get their rooms at discount rates.• And there was the mystifying membership card for the Caravan Club of Great Britain.• Apart from the obvious benefits of being a Harlow Sportcentre member - an attractive personalised membership card being just one.• Club 2000 features an Access Control System which enables members to book and use facilities with a single magnetic strip membership card.• Susskind Eikhl had said that he could get me a temporary membership card in the Writers' Club.• Man at Savoy That's a Blockbuster video membership card, sir.• Present your membership card at the door.• Once there, just show your membership card and take a locker.birthday/Christmas/greetings etc card• Just then the postman called with more packets and greetings cards, amongst which was also a letter.• I doubt that she and Hillary exchanged Christmas cards.• The cost of Christmas cards, free parcels and telegrams is costing the taxpayer millions of pounds, it was claimed yesterday.• In addition to the parcels were seven birthday cards.• Small greetings cards are available at the Information Desk for this purpose.• I liked thinking about him and his two daughters, about the birthday cards and telephone calls.• She emptied the dustpan and searched for something else to do, straightening the Christmas cards on the mantelpiece as she passed.card games• Many also knew card games like monte, poker, and seven-up.• Use the rules of well known card games such as happy families, snap or pairs.• There were, as Yves had predicted so confidently, no card games in the boathouse.• There were no card games, no sound of music, nor food served.• Consider the card games, whist and bridge.• Well worth adding to your card games disks.